When I bought this humble bungalow (over a year ago! ), one of the features I found most interesting was the distorted glass in each of the original wood windows. “Wavy” glass is an understatement. When I really study them, there are bubbles, circles, lines, and other imperfections in every piece of glass. I still remember the 1st or 2nd time looking at the house with the realtor, how beautiful the light danced on the walls through the imperfect glass. Of course, the deterioration of the windows and the rattling glass was one of the scariest features. While the whistling of the wind and drafts around each frame this past winter was an expensive feature. Working in the field of downtown development, I’ve been lucky to attend dozens of workshops and training events about the importance of building preservation and wood windows. I’ve heard them use the fancy phrases, how wood windows are part of a building’s historic fabric, the vast difference between old growth wood and dimensional lumber available today. And more recently I’ve experienced how downtown revitalization grants can help with almost every aspect of restoring a historic building facade, but the Historic Preservation Office is adamant that grant funds will pay to have wood windows restored- not replaced. So over the winter months — as I was reluctantly turning up the thermostat, putting more of my paycheck into the “heating” budget, and watching the shrink-wrap plastic flicker from the cold air blowing in around each window — I began seriously researching the best option for my house. I do advise CAUTION here – only begin typing the word replacement, vinyl, fiberglass, aluminum clad, or easy-to-clean in any internet search engine and the only results will be replacement window companies – hundreds of them claiming that all of my home’s energy problems will be solved if I toss the old windows into a dumpster & install the cheapest vinyl windows on the market. Others claimed I could stand on the windows (before installing them I assume? ), $99 window sales, solid vinyl sash frames, one finger open & close, multiple warranties, and even custom colors for the exterior to match any decor. But then I searched for an answer to my real question, “wood windows restore or repair.” The results were countless forums, threads, magazines, blogs, and even energy efficient building research. 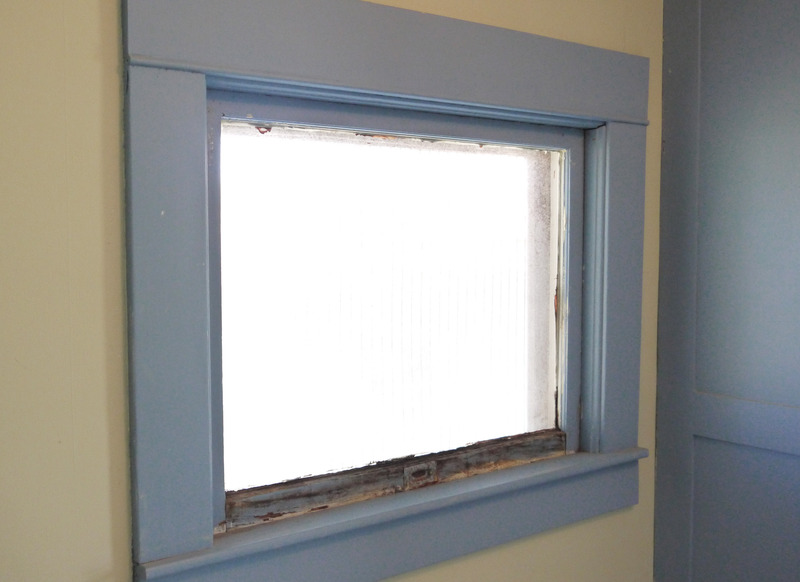 They all said the same – wood windows, when restored correctly with the right materials, adding a mix of original and modern weather stripping, and with a quality storm window- will match or even outperform replacement windows in energy efficiency. Add to that the embodied energy already in the existing windows, the un-matchable strength of 100+ year old lumber, and the compiled data of historic home sales that show original windows add significantly to home & neighborhood values. Or do a little more online digging and read how 5 of the largest US replacement window manufacturers were recently charged with class action lawsuits against their false & deeply exaggerated “statistics” of energy savings they claim their windows will achieve. Eventually these 5 companies settled with the Federal Trade Commission to delete the language from their advertising when they can not consistently prove the numbers to be true. The answer is no. Many of the highest priced residential replacement windows offer only a 20 year (and very limited) manufacturers warranty. Even then the warranty is often for only the mechanical operations of the window – NOT on the low E gas seals, air-tightness, or their bold energy efficiency claims. And all the research I’ve read from professionals in the historic preservation world say property restored wood windows can last another 100 years (although with painting & glazing repairs in the middle at least once). I read every online article, blog, and discussion thread I could find. I watched YouTube videos late into the evenings, trying to take notice of the slight differences from one professional’s process to the next – mostly minor, or they each have a different favorite method for steps such as removing paint, making repairs, etc. But the process is the same – remove all paint, remove all glazing, carefully remove glass. Sand, re-glue, prime, reglaze, paint, and re-install. But I still had so many unknowns and fears about taking this on by myself: the details of weather-stripping (bronze? silicone bulb? vinyl flange? brush.., foam.., felt??) And what are the differences between the many types of glazing compound. Is that the same as glazing putty? And where do I find replacement sash cord that won’t stretch over time, or combination lift/sash locks? Oil or latex primer and then paint? It was perfect timing to learn about a hands-on wood window workshop taking place in Columbus back in March, hosted by a new historic preservation group somewhat affiliated with the organization my workplace is involved with. Two days, hands on learning, BYOT (bring your own tools), and learn the entire process working alongside 3 professionals. Sign me up. In Part 2 I’ll describe the workshop in depth, and the basic tools, methods, & products the professionals there taught us – based on each of their 30+ years in this work. But one blog I have found to be very helpful – and exactly step by step in line with the teachings from the workshop – is The Craftsman Blog. The writer is owner of a historic home restoration company so of course the entire blog is a very full resource for old home enthusiasts. But his specific posts detailing window restoration are almost a printable instruction guide. Thank you Scott for all the incredible content you share, I have learned so much from your blog! This entry was posted on September 2, 2015, 11:11 PM and is filed under Exterior, Home Improvement. You can follow any responses to this entry through RSS 2.0. You can leave a response, or trackback from your own site. Excellent post! In a shameless plug, Old House Journal has been preaching this mantra for more than 40 years. Go to books.google.com and type in “Old House Journal” and “window restoration” for many, many useful hits. I will be following your progress with interest. No shame, Mary! Old House Journal is one of the most comprehensive resources for professionals and DIY’ers like myself when it comes to technical preservation. In fact, I believe one of the first articles I found about restoring wood sashes was an online article from Old House Journal. Just recently, a local resident gave me her collection of Old House Journal magazines from nearly 30 years ago when she and her husband purchased and restored their first historic home. They are still as relevant as they day they were published; like having a preservation library of my own to reference as needed!